THIS IS ONE OF THE FINEST EXAMPLE OF THIS BERNINA MODEL SEWING MACHINE I HAVE SEEN. THE BERNINA 830 RECORD IS KNOWN FOR ITS SWISS PRECISION, EXCEPTIONAL QUALITY, AND HIGH MANUFACTURING STANDARDS. 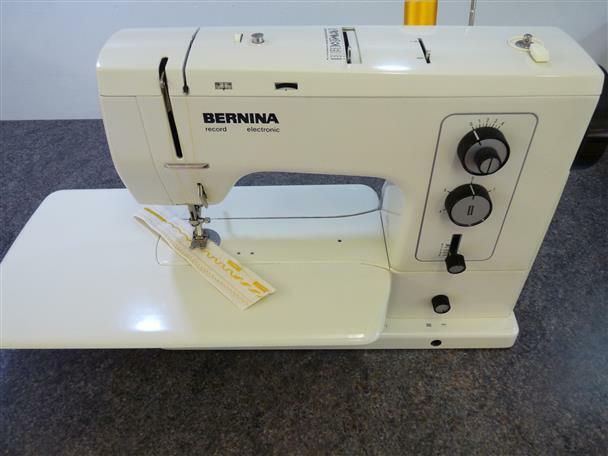 BERNINA IS A TOP CHOICE FOR PROFESSIONAL DRESSMAKERS AND QUILTERS WORLDWIDE. IT WILL SEW PERFECT STITCHES ON ANYTHING FROM THE FINEST SILKS TO THE HEAVIEST OF UPHOLSTERY FABRIC. THEY PRODUCE SHARP AND STRAIGHT STITCHES, THAT MAKE THEM DREAM MACHINES FOR MOST QUILTERS. THE STITCH ACCURACY OF THESE MACHINES IS AMAZING. THIS MACHINE DOES NOT JUST SEW FABRIC, THE FABRIC FLOWS THROUGH IT EFFORTLESSLY. BERNINA IS TRULY THE ROLEX OF SEWING MACHINES. THIS 830 PURRS SO QUIETLY, AND SEWS SO WELL, YOU WILL BE LOOKING FOR REASONS TO USE IT. IT HAS 6 PRACTICAL AND 15 DECORATIVE STITCHES BUILT IN. THE BERNINA LINE SETS THE LUXURY STANDARD FOR ALL SEWING MACHINES. THEIR REPUTATION FOR QUALITY AND LONGEVITY ARE LEGENDARY. THE 830'S ARE EXTREMELY POPULAR, BECAUSE THEIR METAL CONSTRUCTION AND ATTENTION TO DETAIL IN DESIGN, MAKES THEM A MACHINE THAT WILL LAST FOR GENERATIONS.